Real life trumps fairy tales in this collection of positive female stories. Goodnight Stories For Rebel Girls shares the lives of 100 amazing women throughout history. From athletes to activists to musicians to lawmakers, each true tale is a celebration of bold women. Creators Elena Favilli and Francesca Cavallo both longed for a book like this when they were young, and created it to fulfill their shared lifelong dream. Their goal is use the stories—and the fabulous women at the center of them—to inspire and encourage future generations to dream big, take risks, and become their own hero. And it’s not just young girls who will be moved—any reader will be taken in by the uplifting stories. A portrait created by a female artist complements each woman’s story, and there’s space for readers to create their own entry. Elena and Francesca believe that every child deserves to grow up believing they can achieve anything. Their beautiful book teaches them to dream big. Hello everyone! 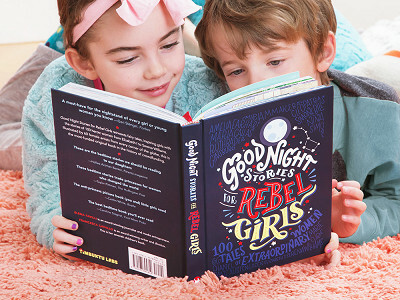 I'm proud to introduce Goodnight Stories for Rebel Girls to The Grommet. I'd be happy to answer any questions you may have! I see the children in the promo photo, but what is the age range of the target audience of readers? @Alessandra I gave this book to a 6 yr.old granddaughter, she is an avid reader but I was concerned it may be too advanced for her to read on her own, it is not. She is really into this book right now and I can see it being reread at different ages. Hello! What a wonderful book! Do you have a discount for educators who wish to put this book in their classrooms? Hi Denise, shoot an email to our wholesale team ([email protected]) and they should be able to help. We would love to see this book in classrooms nationwide. @Scott It's not too babyish :-) In our experience girls the same age as yours are enjoying it tremendously! Are there any stories about Latinas, or any women of color? Yes there are, Paula. Serena Williams, Frida, Michelle Obama, and Eufrosina Cruz just to name a few. Is there a list of the 100 women in the book? @Kathy No, we have not made the full list available. Only those who own the book have access to the full list of women featured. Thanks for asking! I purchased two of the books as Christmas gifts, one for my sister and one my daughter who live two time zones apart. Several nights a week, my daughter (almost 6 year-old) and my sister read together about some inspiring girls and women. This quickly became the highlight of both their days. This has been a wonderful gift that we will be able to share for many years. Thank you Timbuktu Labs! Thank you for sharing @Lavonne . 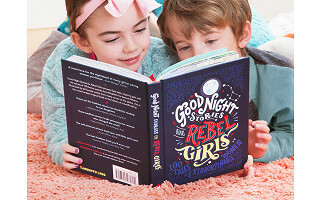 We love to hear stories of family spending quality time with each other while reading Good Night Stories for Rebel Girls. Thank you for thinking the book was special enough to gift to two of the ladies in your life. We hope they are both inspired! Real life trumps fairy tales in this collection of positive female stories. Goodnight Stories For Rebel Girls shares the lives of 100 amazing women throughout history. From athletes to activists to musicians to lawmakers, each true tale is a celebration of bold women. Creators Elena Favilli and Francesca Cavallo both longed for a book like this when they were young, and created it to fulfill their shared lifelong dream. Their goal is use the stories—and the fabulous women at the center of them—to inspire and encourage future generations to dream big, take risks, and become their own hero. And it’s not just young girls who will be moved—any reader will be taken in by the uplifting stories. A portrait created by a female artist complements each woman’s story, and there’s space for readers to create their own entry.